Our Porters woke us at 4 a.m., holy crap it is too early for this. I did not sleep very well at all last night. In fact I have not slept well since Tuesday, no wonder I am so tired. It has been very difficult for me to sleep here, in these tents, at these altitudes, not to mention I hate these mummy type sleeping bags, there is no room to move around. Today is a day of rush, rush, rush, up at 4, breakfast at 4:20. Not a particularly good breakfast either, I would sure like another one of those omelets. Never the less, we had to rush through it, because we have to pack up and be out of here by 5 a.m. In fact by the time we sat down for breakfast, finished and walked out of the food tent, the rest of the camp was already broken down and packed, these Porters know what the hell they are doing. The Porters will be leaving before us because they have to run down the the mountain to catch their train back to Ollyantambo. They will immediately be lined up to start another trek for another tour group, this is what they do everyday of the week. At camp on Thursday, Nico called for us to join in a Trail Ritual, we line up on one side of camp, Porters line up on the other side. We introduced ourselves, told them a little about ourselves and what we do. They told us their names, what village they are from and their age. These are such honest, hard working people unlike any I have met before. They have a true love for their Peru. A passion to please visitors, in fact everyone that I have come into contact with has been very friendly and concerned with our well being. 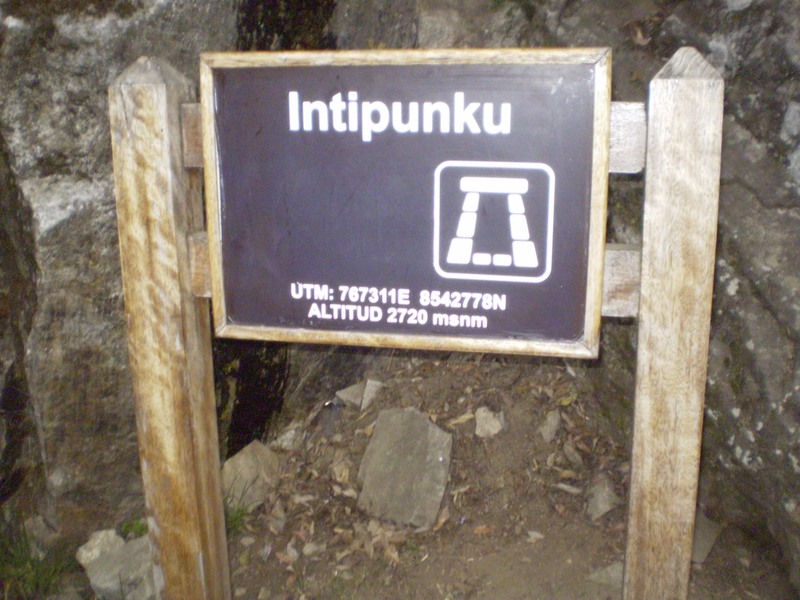 Although our Porters didn’t speak English they seemed to understand enough of it. Nico explained that they are very proud people, but also very poor, no real education and no job prospects, so this is what they do and you can tell they are very happy to do it. All this makes me realize how lucky I am. Although I really didn’t realize, or even think about it for that matter, our guide, Nico has a schedule we must stick to, which is why he is always pushing us to stay on track and leave at the right time. So were off, at 5 a.m. 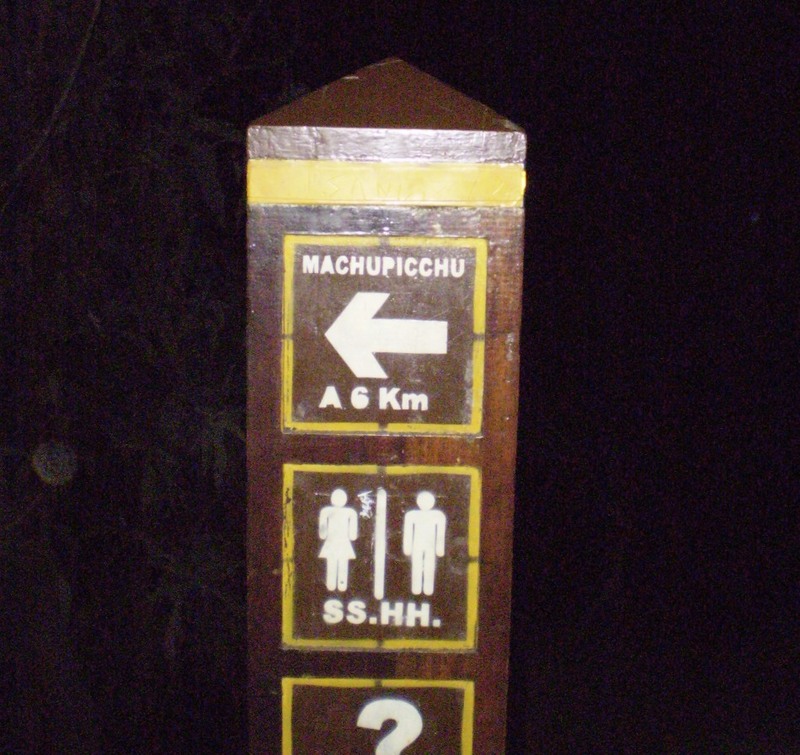 It was still very dark, which was pretty cool to do really, hiking along the Inca Trail in the pitch black of darkness, with nothing more than small flashlights. 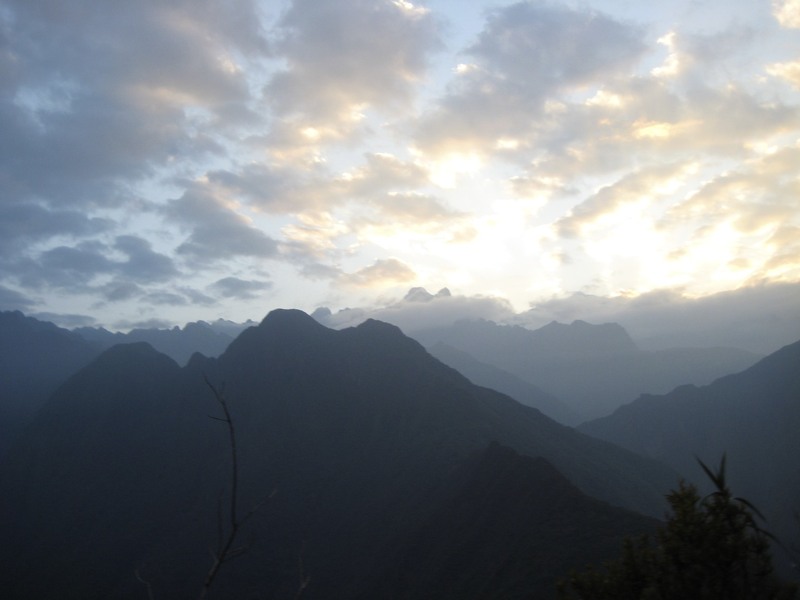 Today’s trek will only take about 2-1/2 to 3 hours, so we expect to arrive to Intipuku, The Sun Gate between 7:30-8 am. We are on our way, our group splits pretty quickly, Sandra, Christy, Patrick and I are with Hernan, while the others go ahead. It will take us a little longer as we will be going a little slower to help Sandra, but once again she is a trooper, her ankle is in pretty bad shape. If I have not already mentioned, there are three checkpoints along the trail, here you stop and check your passports against your permit to be on the trail, this morning we will hit the last one. The trail today was not as challenging as the other 3 days. There were spots that climbed pretty extensively, but it was mostly flat, loose and rocky. The last 5 minutes leading up to Intipuku, The Sun Gate was set of stairs straight out of an Indiana Jones Movie. The final steps must have been nearly a 50 degree pitch and the steps were very small, and tall, the steps were about half the length of my foot in terms of depth. Some of our group made the decision to get up the steps on their hands and knees because it was so difficult. 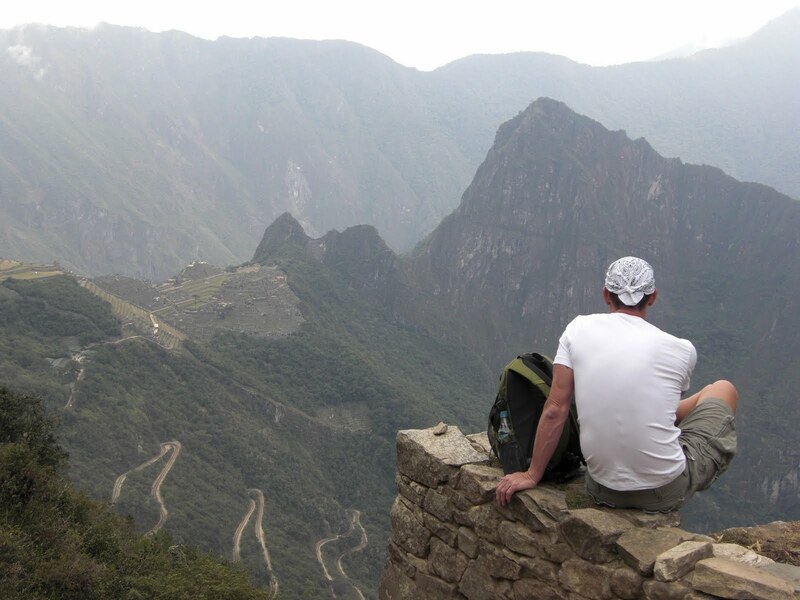 But WOW, it was spectacular as you come over those steps, you get your first glimpse of Machu Picchu. After spending the last 3-1/2 days trekking nearly 30 miles through the Andes, we have arrived at our first view of the Lost City of Machu Picchu. It was a very emotional experience for me and I did not expect that, I am not a very emotional person. As I looked around at our group, everyone was in tears, including myself. I can not remember ever having feelings so deep, that I would cry. but today was such a huge accomplishment. The emotional release was beyond my control. The effort both physically and mentally was more than I anticipated. We stayed at the Sun Gate for about 30 minutes, after all we still have some trekking to do to get to Machu Picchu, it took us that long to pull ourselves together. I can not speak for the others, but I also used that time to reflect on what it took to get to this point. We had a small celebration as Peter opened a small bottle of whiskey. I think I was most proud of Sandra who truly had to push her way through, watching her climb those ridiculous last 50 feet of steps on her hands and knees, pushing her way to the top is beyond my vocabulary. I don’t believe anyone can truly appreciate what it takes to do this, unless you have done it yourself. 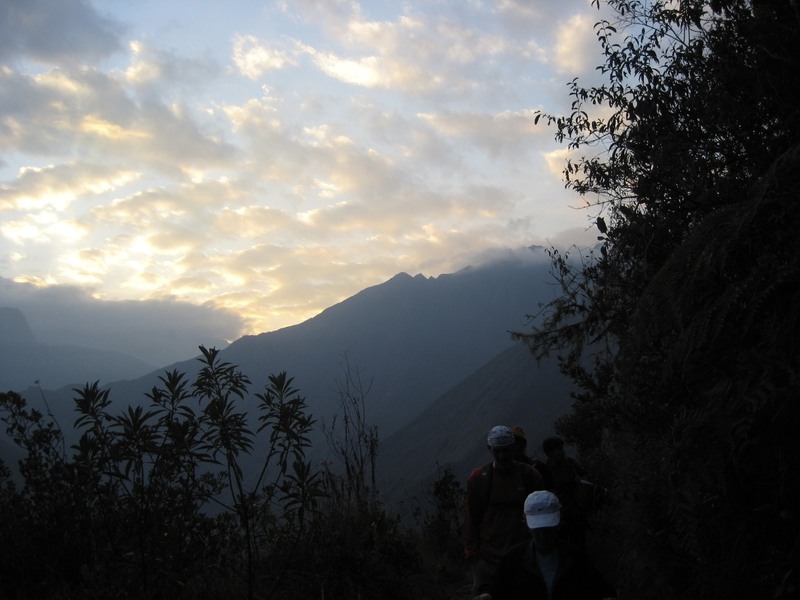 In the beginning we referred to to this trip as our hike to Machu Picchu, but somewhere along the way it turned into the hike to test our limits. 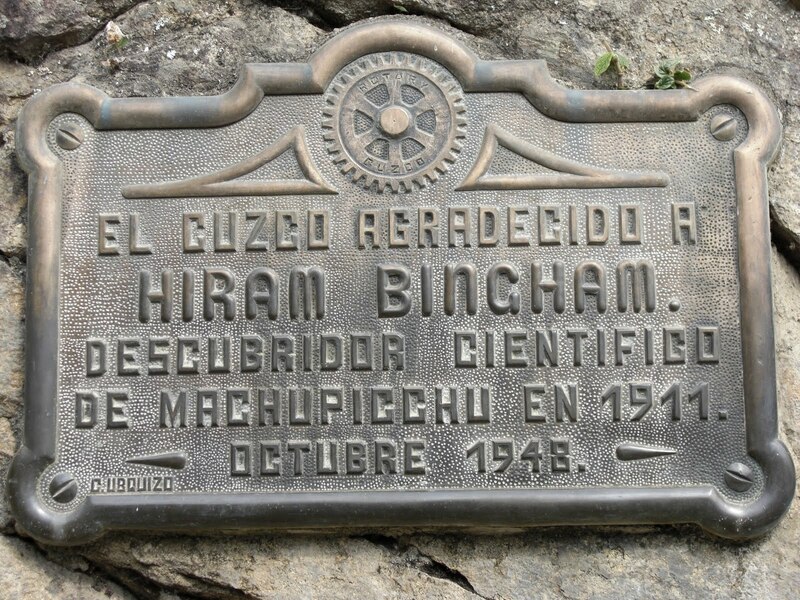 And Machu Picchu became secondary. At this point we are not even there yet, we still have another hour to go, but our goal is in sight now, it seems easier to finish this adventure. Just reaching the Sun Gate felt like the end, but in fact it was just the beginning of our group truly coming together as friends, accomplishing a great fete, together. 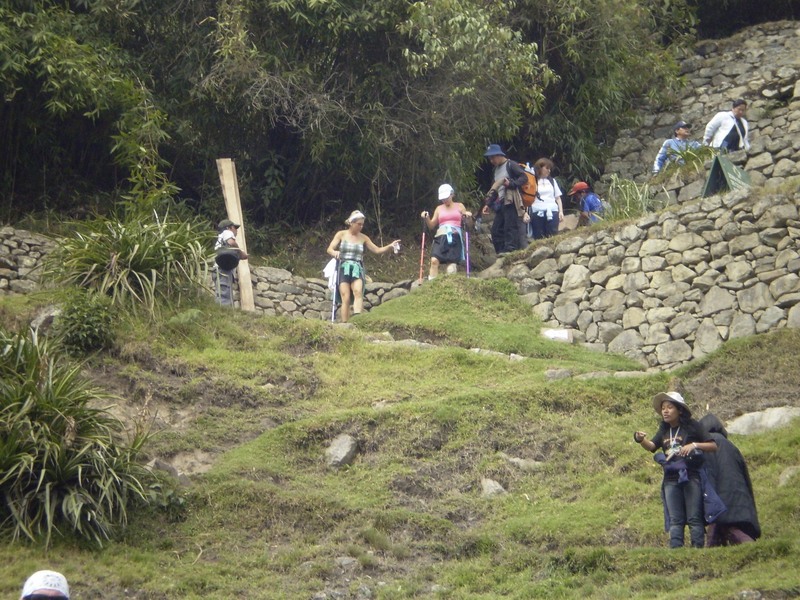 Intipuku, (The Sun Gate) was built by the Inca high up on a hill to celebrate the Winter Solstice. 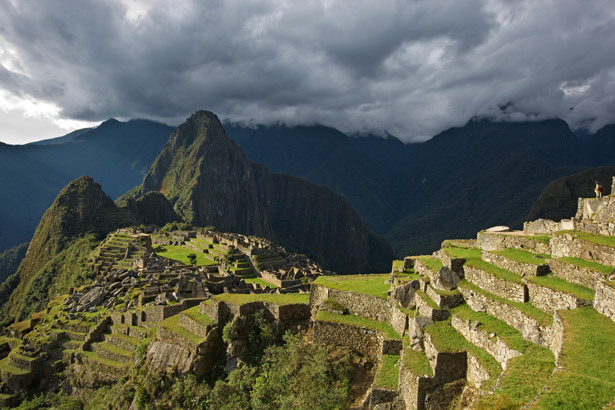 The sun would rise and shine straight through the gate onto the city of Machu Picchu making the City appear to be golden. The last hour was all downhill as they say, literally and figuratively. You might think it is easier walking downhill, but it is not so. It stresses your legs and knees much more, leaving your legs in severe pain at times. 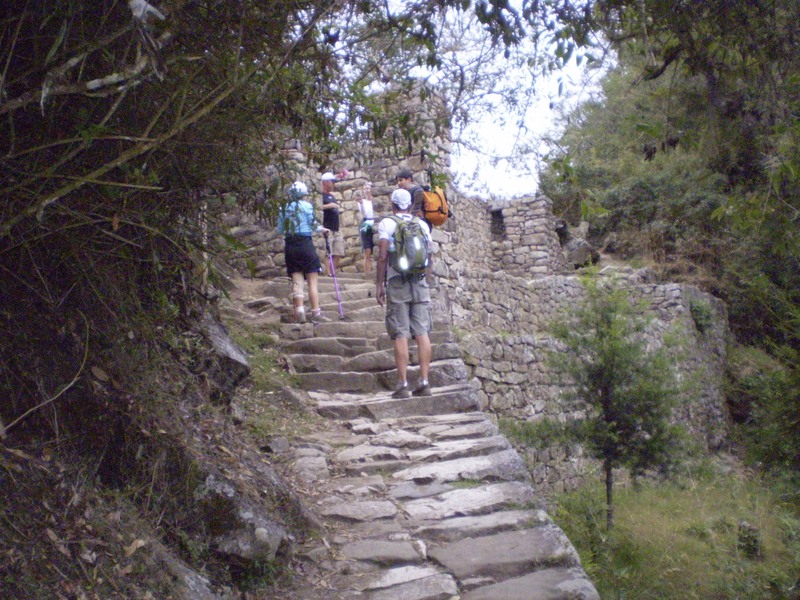 Walking down an occasional staircase is no big deal, but walking down an Inca staircase with small steps and 30-35 degree declines after walking for miles already, is a whole another story. As we made our way to Machu Picchu, it is amazing just how large this “Lost City” is, how could it possibly have been “Lost”, it’s huge. I can assure you the pictures don’t do it justice. 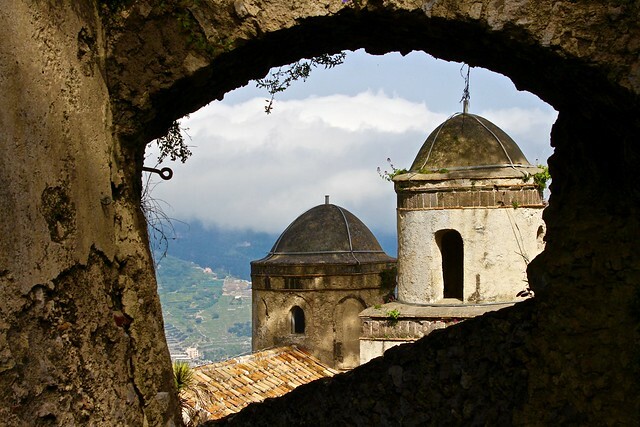 It is a vast city built with intelligence and thought. The sheer beauty takes your breath away, it seemed as though we all got our second wind and couldn’t get there quick enough. Patrick and I walked at a very quick pace, we wanted to end this part of the journey and we also had to pee very bad. Once we arrived, we made our way to The Sanctuary Lodge (more on this place later), tonights accommodations, hell yeah. A warm bed and hot shower, we dropped our bags, rested and waited another 20 minutes for the rest to make it. Sandra’s accident was worse than we all thought. As you know from my last post, she fell off the trail, that just doesn’t tell the story, you can fall 3 feet off the trail or 300 feet. After learning more about her accident I think she was very, very lucky, aside from her ankle, she banged up her knee pretty good too, which immediately swelled up. But the worst of it was her foot, she said she felt a crack. As it turns out she had fractured her foot in 3 places. This happened Friday afternoon, I estimate she had to walk about 4 kilometers to camp on Friday and another 9 kilometers to Machu Picchu. 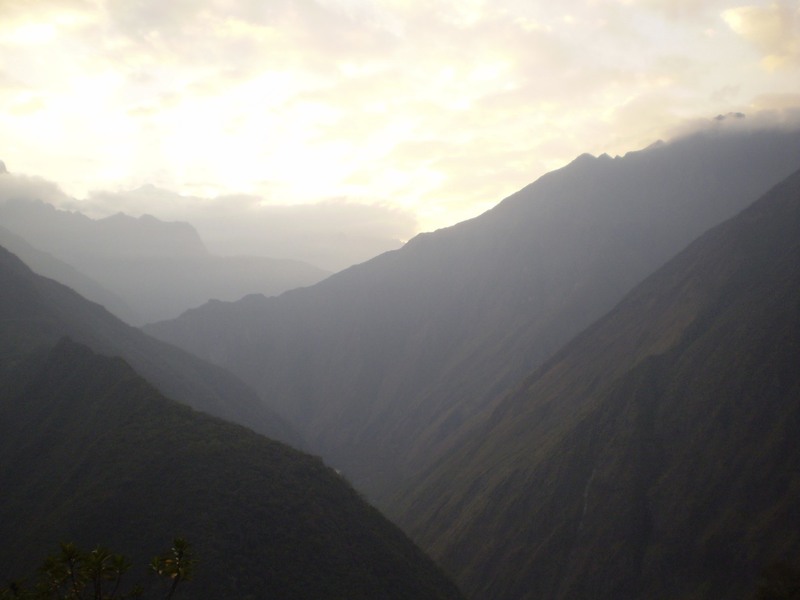 Once we arrived to Machu Picchu, she was rushed right to the Medical center, the Doctor told her she most likely broke her foot and must stay off it until she can get back to the states. I just can’t imagine the pain she must have felt and what it took for her to power through. By my estimate she had walked 12-13 kilometers on a broken foot, along a very unstable, long, treacherous trail. What a gutsy lady, it just goes to show what the human body and mind can endure and overcome. 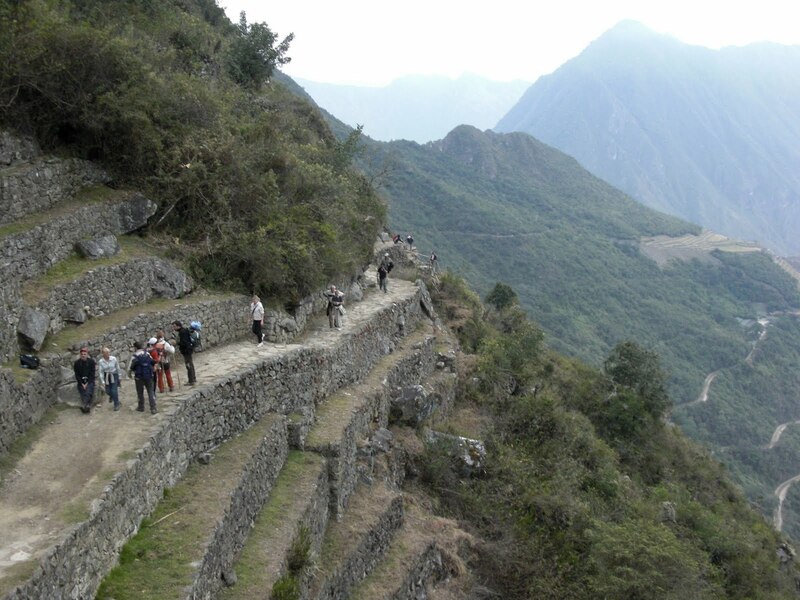 What was so disappointing for her was that her goal of going to Machu Picchu, was only partially fulfilled. 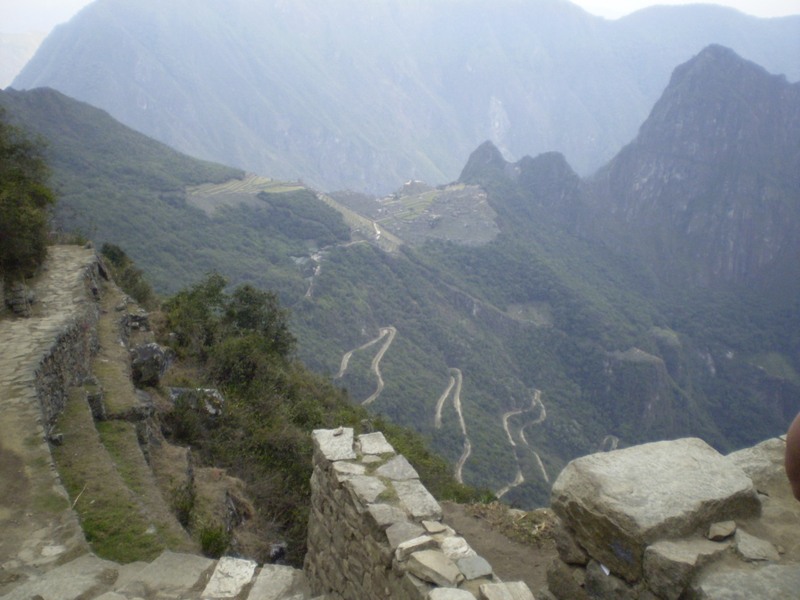 Because she was told to stay off her foot, she was in a wheelchair, and could not enter the Famed Lost City of Machu Picchu. Again, Nico was on a scheduled and wrangled us all together so we can go into Machu Picchu for the final leg of our tour. I can not say this enough, Nico is only 24 years old and is very knowledgable and passionate about the Inca and Peruvian culture and history. It seems as though there is nothing he doesn’t know. Did I tell you that before he started as our guide, he had just finished a 7 day hike through the Glaciers all the way to Machu Picchu. 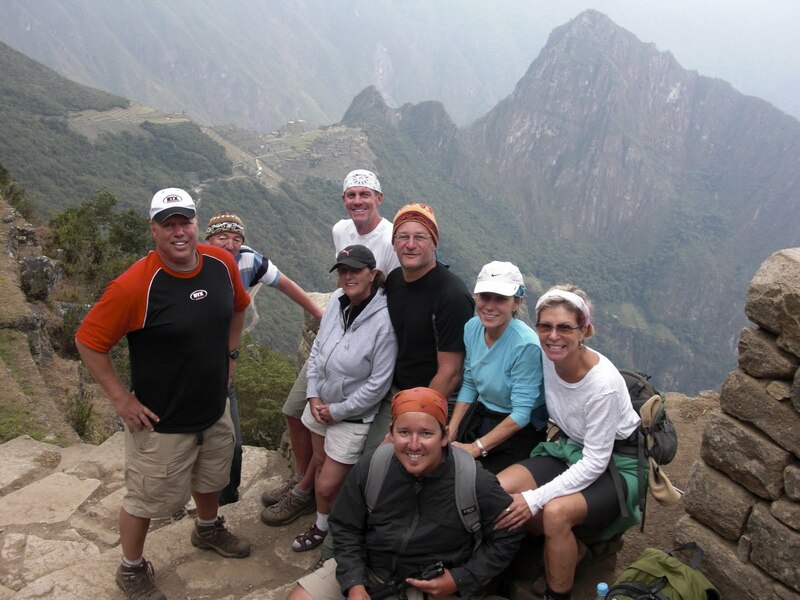 We all gathered, expect for Sandra and Christy, and went in with Nico for the historical tour of the Lost City of Machu Picchu. He walked us through every part of the city pointing out the sacred locations, the meaning of the stone work through out along with everything you could possibly learn. I will share more on this in the next post, as it is this one is getting long. ← Aviophobia…..what the heck is that? Looks like it was quite an experience. Thanks for stopping by and liking my post. It was an awesome experience. One I highly recommend to anyone who will listen to me. There is much more to the story. Stay tuned.